My expertise is in treating individuals with eating disorders. As a registered dietitian nutritionist, I never do this work alone. I am always working in tandem as part of a team. I believe it’s the only effective and ethical way to support an individual to full recovery. And just like my clients who need a full team behind them, my business is no different! Today I am celebrating the exciting launch of a beautiful new website and brand that more accurately reflects the work we do at Marci RD – a brand that is about compassion, warmth, empathy, teaching and healing. When I began this process of rebranding I thought it’d take a few months. It took much longer than that and it took the work of an entire team, each of them possessing unique skills and sets of expertise to lend to the whole project. I could never do the work I do alone. I am able to counsel, teach, mentor, and advocate because I have a team of people (a small village!) who make it all happen, largely behind the scenes. So this is a blog post to acknowledge and thank the amazing and talented folks who brought my vision to life. Michele Levy, Brand Strategy Expert – Michele helped me get specific and clear about what I want my business to communicate…and then she provided me with the language to bring it all to life. She is a wordsmith wizard and a joy to work alongside. Our sessions were a foundational step to putting this whole project on the right trajectory. J Sherman Studios – The team at J Sherman weaves together creativity, polish, unbeatable communication, and enduring patience. They worked with me through every (I mean EVERY) round of edits and produced a visual product of my brand that is everything I hoped for and more. They listened to all of my crazy and disorganized ideas and executed their creation with stunning efficiency. Modo Design Studio – It is fair to say I am aware of about 5% of the work that the team at Modo executed on my behalf. Phil is a master of astounding organization, attention to detail, responsiveness, and let’s be honest, hand holding. Their management of the back end and technical work to bring this vision into the world while honoring my budgetary limits was nothing short of magical. Blake Fitch Photography – We had an utter blast working with Blake and her team to capture the essence of our work. Blake’s creativity, attention to detail, endurance, and ability to provide a quick turn around was pretty close to magic. PepperIt Marketing – While I am the face and voice of my business, the team at PepperIt Marketing makes it happen. I have been in awe at how each member of the team works incredibly hard to really understand the radical work I am trying to do while providing the expertise in strategy to make my message heard. Their teamwork is seamless, their patience with me not yet exhausted, their communication swift, and commitment to my goals ever present. The team at Marci RD – I’m so glad you are on this crazy ride with me. Please don’t say you want to get off! No one gets through this life successfully without the support of many. We all need the support of others around us. 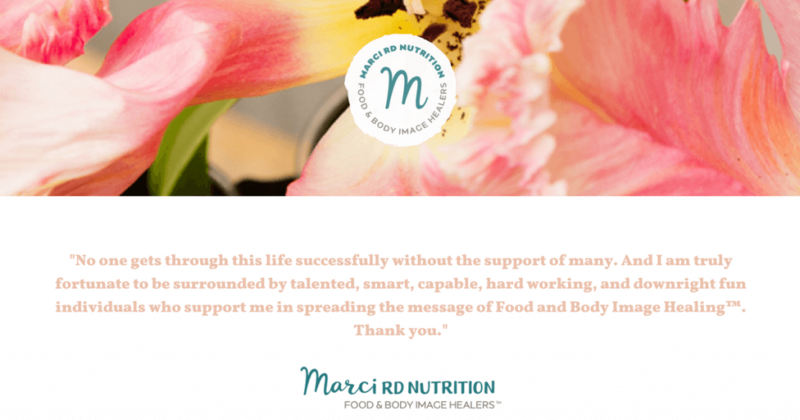 And I am truly fortunate to be surrounded by talented, smart, capable, hard working, and downright fun individuals who support me in spreading the message of Food and Body Image Healing™.